Chasing upland birds can be a very physical game. Depending on the area you are hunting, the terrain and vegetation can be difficult to navigate. Similar to any other hunting excursion, proper gear and preparation will allow you to be successful when the opportunity presents itself. As the season continues to near a few things must be considered. How is your physical shape? Do you need to replace or repair any of your gear? Is your shotgun cleaned? As you consider these things be sure to take note on what needs attention. If you are still unsure about what will make you more comfortable and successful this year continue reading to learn more. Your physical condition before the season starts will dictate how far you can venture from the truck and what types of vegetation you can push while working the birds. This also relates to your ability to maintain control over your instinctual reactions to raise your shotgun and harvest birds when the opportunity arises. Shooting trap in the off-season will make sure your shooting is sharp and your ammunition/choke combination patterns well. To make sure you are physically prepared, long walks and running will provide you the endurance to work hard in the field. This, coupled with your best friend and hunting partner (bird dog) will allow you both to be in the best shape possible. To continue the topic of your bird dog we must not forget that they need to train and maintain their physique as well. Taking them along on your walks and running exercises will allow them to build up their respiratory strength along side yours. Keeping their noses and attentiveness strong, working with dummies and scents will keep their mind on the game. Use the scent of the game bird you are chasing paired with a dummy or a wing from the bird to train their nose. Hide it in the bushes or throughout your yard and walk as though you are in the field. Allow them to sniff out the scent and locate the dummy for a retrieval. This, along with the training strategies you may currently use, will keep your hunting partner excited for the upcoming season. Clothing seems to be the last piece of gear considered when preparing for an upland hunt or season in general. Chasing these game birds is an exciting activity that takes place from early fall to winter. Versatile clothing is a necessity when it comes to this type of hunting. Breathable and lightweight are the key features that must be considered through the buying process. A variety of brands, styles and fits are available for the average hunter and upland enthusiast. This also includes footwear. Protecting your feet is very important, especially when you may be driving miles on your feet. Walking through stubble fields, marshes and wet conditions can be tough on your boots. Water proof material such as Gore-Tex or neoprene/rubber boots are the most versatile. Continually check the quality of your boots and do not overlook any significant damage. Find what fits your needs and comfort so you can focus on your hunt. If you have ever hunted with dogs you know they can be the difference between success and failure. Hunting with a dog will typically allow you to locate, flush, harvest and retrieve more birds than the average hunter. Gear for your hunting partner includes hunting accessories, medical kits and training equipment. These are all important to ensure the efficiency of your dog and also their safety. Choosing the right shotgun can be a tedious task. This is due to the vast variety of brands, styles and gauges. When looking into a new shotgun for upland hunting, keep in mind that you want something lightweight and quick handling. A 12 or 20 gauge are typically the most popular for they are the most versatile for all hunting purpose. Other gauges are becoming more popular including the 16 and 28 gauges. This is due to their lightweight features and their shootability for all experience levels. Barrel length is typically 26 to 28 on an auto, pump, side-by-side or over-under. 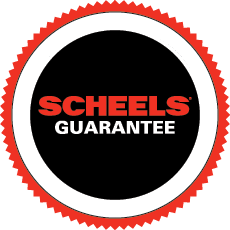 To see how these shotguns handle (weight and fit), stop by your local SCHEELS today. There are many accessories that will assist you in the field from pads, sights, slings and choke tubes. The only way to find out how well they work for you is to try one out. These accessories are designed to make you more efficient and deadly in the field. The standard upland ammunition is a high brass load ranging from 4 to 6 shot. Typically, a 12 gauge will be paired with 2 3/4 inch shot shells and a 20 gauge with a 3 inch. This is dependent on the distance of the shot and the comfort level of the shooter. It is also common to stack different loads of ammunition for different shots. Meaning, use a 6 shot load for your first and second shots and a 4 shot load for your third and final pass at the bird. Keeping your ammunition dry and in a non-humid environment is essential to proper storage of shells that last through the season. Storage boxes are the most convenient option for this due to their shape and easy carrying. A common occurrence is to use a waterfowl blind bag for a shell carrier. This makes for better transportation, but can lack the non-humid environment essential to protecting your ammunition.